Hamdard products are known for their quality and effectiveness. Earlier, I reviewed Hamdard's Joshina and it is time for one of its popular product Hamdard Roghan Badam Shirin Sweet Almond Oil. 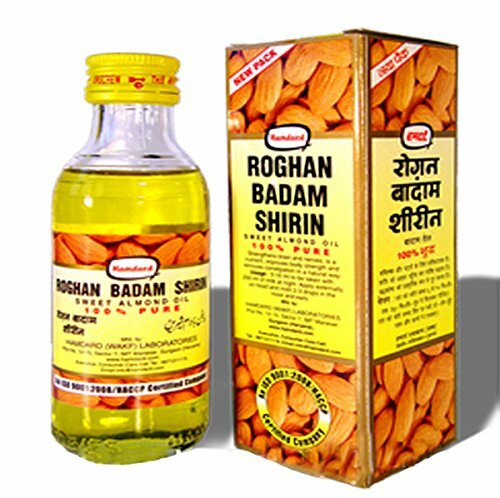 If, I go back to the my childhood memories, then I only see Roghan Badam as the first and most used Almond oil in our home. 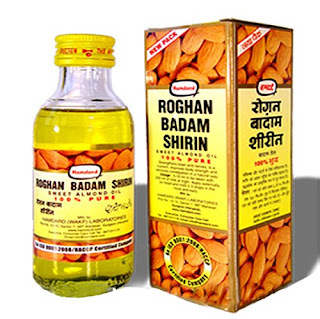 Initially, in most of the shops Roghan Badam Shirin was the only Almond oil available. With time, it got competition from Dabur's almond oil and other local brands. We have always put our trust on Hamdard's almond oil because of the great quality it offers. It is much thicker oil as compared to other almond oils in the market and after use, we can find that it is more effective than others. You can use this almond oil in any way and you will always find satisfaction. I have used Harmdard Roghan Badam oil to put in my milk and to massage my face. Roghan Badam oil is very effective in treating constipation. People suffering from constipation can put some drops of Rogan Badam oil in milk and drink it every night. Due to the laxative properties of Badam oil, they will get relief from constipation. You can easily use this badam oil to give to your children for sharper brain. It looks that Hamdard has retained all the benefits of almond in its Roghan Badam Shirin. Amond oil is a good source of energy so it keeps your body warm in the winters. It is also a tonic for your heart and brain. It helps you to relieve tension and build strong bones. In India, it is common to massage the body of newborn or kids with almond oil so that they can become strong. The rich moister in almond oil is very good for dry skin and dandruff. Hamdard claims that their Roghan Badam Shirin is made with sweet almonds; therefore, their product is 100% safe and pure. My rating for this product is 9 out 10 because I have always found it effective and good in quality.